There are many different ways to vape. That is to say, a wide variety of implements have been invented in recent years to use for vaping, from vape pens to boxes, e-cigarettes to atomizers. One of the newest additions to this selection is vape mods, which are literally modified versions of those other vaping instruments. While regular vaporizers function adequately for most average users, some true vaping enthusiasts find standard vaporizers insufficient at meeting their needs. ● single heat settings that cannot be regulated. ● adjustable heat settings for a more customized, controllable vaping experience. It is this final factor—the ability to customize heat settings—that brings safety to the fore when using (or deciding whether to use) a vape mod instead of a standard vaporizer. It is still possible to combust a substance in a vaporizer, and even more possible in one modified to permit the user to increase the heat to their desired settings. For example, a new subculture of people who vape called “Cloud Chasers” compete to see who can produce the biggest, longest cloud of vapor when they exhale. Vapor, in its truest form, is invisible. Therefore, the more visible the cloud ejecting from a person's mouth after vaping, the more smoke there is in that cloud. Turning the heat up on a vape mod without a clear awareness of the proper vaporization temperature and combustion point of the substance you're vaping could cause you to inhale smoke along with or instead of your vapor, thereby, in essence, defeating the entire health purposes for vaping in the first place. What Exactly is a Vape Mod? 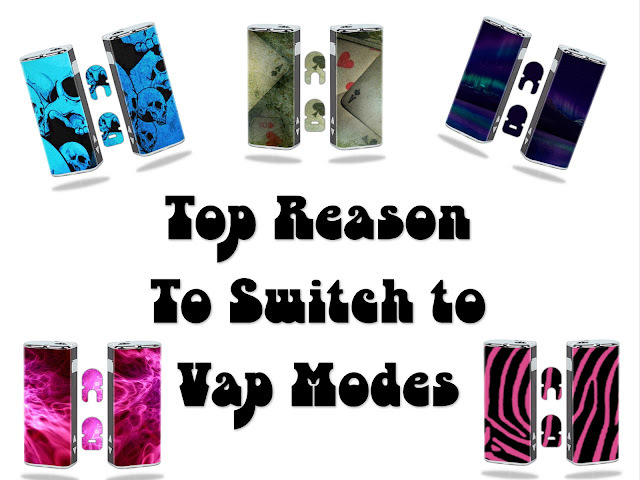 Vape mods are made for all types of vaporizers, from handheld to tabletop models. In its most basic form, a vape mod is simply a metal tube with a battery chamber and a button that, when pressed, creates a circuit that produces a current. This current can then be used to power any number of atomizers attached to the unit. The fundamental mechanical advantage of a vape mod is that it contains no wiring or electronic components of its own, and therefore possesses none of the disposable parts that can break and cost loads to replace. By the same token, by using a replaceable battery instead of the built-in battery powering most standard vaporizers, the device itself doesn't become useless all of a sudden when its battery runs out, or require an expensive component replacement. Vaping with a vape mod requires a lot more knowledge about the substances you're vaping, a lot more awareness while you're vaping those substances to regulate vaporization versus combustion, and a lot more finesse in using the mod to keep from inhaling a cloud of smoke or, on the flip side, failing to heat up the substance enough to get any vapor from it. The other risk to be aware of when using any sort of vaporizer, whether standard or a vape mod, is that any device using a lithium battery cannot, by nature, by 100% safe, as lithium batteries pose their own health and safety risks. Before using any device with a lithium battery, make sure the battery is new and undamaged. ● and of course, to always dispose of exhausted batteries properly. All this is not to turn you away from considering a vape mod for yourself, however. On the contrary, a vape mod can empower you to use whichever substances you like in your vaporizer and reap each of their benefits optimally and safely. It just takes a bit more of a learning curve to get accustomed to than a standard vape pen or other vaporizer with a single heat setting. This guest post is courtesy of MightySkins, a custom vinyl wrap and skin company featuring items like mod skins, sigelei skins and istick skins as well as other assorted wraps for electronics.